The DUP leader Arlene Foster has said it will take a long time for her party to trust Sinn Fein again after they "acted disgracefully" during the last round of talks. 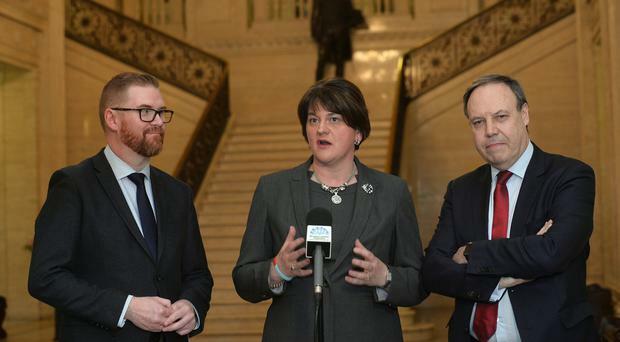 She was speaking after the Northern Ireland Secretary of State met with the parties on Thursday in a bid to resurrect talks to restored the Stormont institutions. 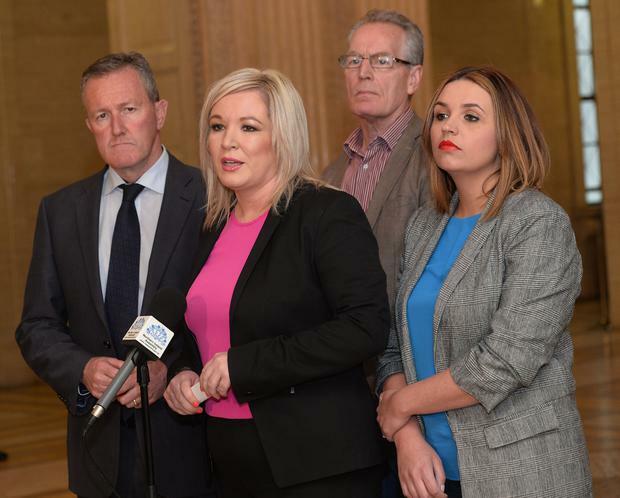 Sinn Fein leader Michelle O'Neill claimed the DUP has checked out of power sharing in Northern Ireland and the British Government is pandering to it because of the deal struck between the two to keep the Tories in power. Sinn Fein brought down the government at the beginning of last year over the RHI scandal and commitments on dealing with the past and legacy issues. Fermanagh and South Tyrone MLA Foster said that Mrs O'Neill's comments were "crazy talk". "Therefore the building up of trust, I think, is going to take an incredibly long time and is going to take actions," Mrs Foster said. "It's about time that they recognised the role they had in terms of the breakdown." Mrs Foster said that although the meeting was useful challenges remain. “This was a useful meeting where we reiterated our commitment to form an Executive and emphasised the need for decisions to be made. I reminded the Secretary of State that four of the five parties would form a government. Today has proved that Sinn Fein is living up to its name – its standing alone and is isolated. Sinn Fein’s Irish language pre-conditions are the stumbling block," she said. "Whether it is schools, roads, hospitals or broadband the absence of an Executive is impacting on everyone in Northern Ireland. Key health reforms were agreed with Michelle O’Neill in October 2016. Those have been gathering dust whilst Sinn Fein prioritises its narrow agenda. "I have urged the Secretary of State to recognise the desperate need for Ministerial decisions to be made so the £1b package delivered by the DUP-Conservative Confidence and Supply Agreement can be properly utilised." Sinn's Fein leader in Northern Ireland Mrs O'Neill said the Conservative party was prioritising their relationship with the DUP at Westminster rather than focusing on restoring the Stormont institutions. "The DUP have checked-out of power sharing," she said. "You can see in their recent statements they have said there is no likelihood of these institutions going up anytime soon. "That is the wrong approach. "That is an approach that is being pandered to by the British government because of their confidence and supply deal with the DUP." SDLP leader Colum Eastwood said that the only solution was an Intergovernmental Conference. “The Secretary of State offered no direction in terms of moving the Stormont impasse forward. Instead there was a rehearsal of a list of ‘options’ which various parties had put to the British Government over the past 15 months," he said. “The SDLP's analysis is very clear, as things stand we believe there is only one option and only one solution. "The DUP and Sinn Féin are incapable of making this deal. Therefore, the British and Irish Governments should re-convene the British Irish Intergovernmental Conference in order that a package of legislation can be jointly agreed. This would finally clear the decks of disagreement, end the deadlock and get us back to work." 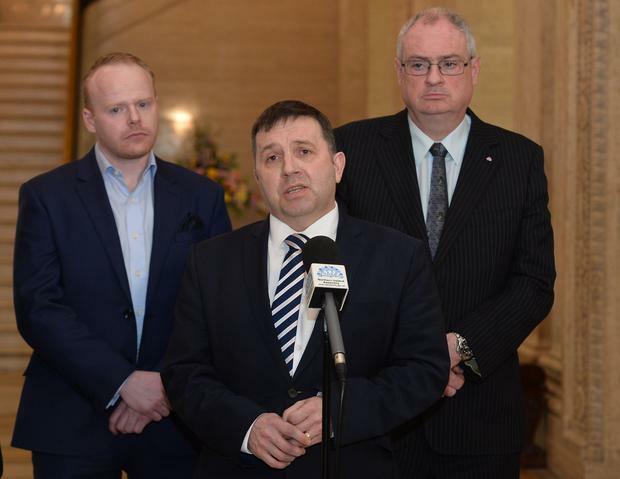 Ulster Unionist Party leader, Robin Swann stated that people are suffering due to a lack of political progress and called on the Secretary of State to act. “Devolution has been left to wither on the vine for too long. Local politicians across the political spectrum have a huge responsibility to get the Assembly and Executive back in place," he said. “Just look at today`s latest waiting time statistics with less than 60% of patients attending our major emergency departments in March being treated and discharged, or admitted within the target period. The figures are absolutely horrendous. People are suffering due to a lack of political progress. It`s time to drop the red lines and get devolution restored."